Kilchoman is Islay’s youngest and smallest farm distillery. When Anthony Wills started his project in 2005, it was the first new distillery to be built in 124 years. A portion of the barley is grown at the farm and is used exclusively in a 100% Islay whisky. The rest, needed for the core expressions Machir Bay and Loch Gorm, is bought at Port Ellen Maltings. 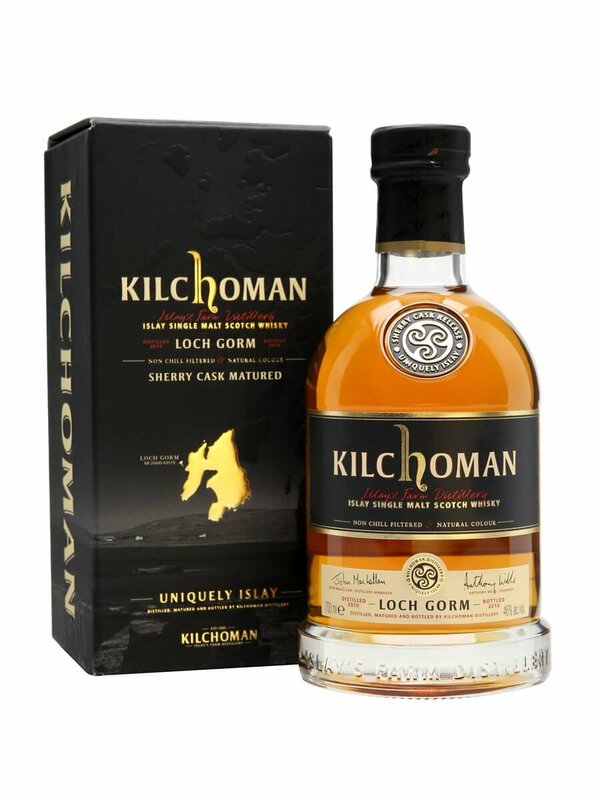 Kilchoman Loch Gorm is named after the peaty loch nearby. It is the primary water source for the distillery. This expression is the only one in the core range that fully matures in sherry casks. For the Loch Gorm 2014, they only used first-fill Oloroso sherry butts. Colour: Loch Gorm has a beautiful golden hue, still more towards the citrus side then you'd expect from Oloroso casks. This is partly explained by its young age. The colour is all natural and the whisky is non-chill filtered. Nose: The first nosing reveals a stingy smokiness. Once the smoke settles down, a complex mix of fruity flavours is revealed. Canned pineapple and peaches with syrup and a coulis of cherries and red berries. The smoke is continually struggling to remain prominent and is likely to win the battle. A fire that has been built with wet and mossy wood. This whisky packs a lot of earthy aromas. In the course of time, it gets slightly medicinal and somewhat rubbery. Think bicycle tyres. Some chocolate flakes and cloves also float around. Water really turns it into a doctor’s cabinet. Iodine bandages and Band-Aid. Rubber gloves and sweet grapes. Taste: The first impression on the tongue is quite oily and warming. Again canned fruits and cloves with a generous dose of pepper. Oat biscuits with hawthorn berries. Water unleashes even more spiciness. Pepper and smoke take the lead. The fruit is really cast aside now. Finish: The finish is very long . Slightly chemical and warming. The coulis of cherries has returned, with a few extra spoons of sugar. This was my first encounter with Islay’s youngest distillery. Just like Bruichladdich, they market fairly young whiskies with a surprising complexity. The sherry flavours deliver that little something extra. This will be an excellent winter companion. The first Loch Gorm already earned a Gold medal in the International Wine & Spirits competition. And I have a feeling that number two chooses to follow the same path. It was launched in the first week of April and is now reaching specialist stores all over the world. Some 10.000 bottles were produced. This whisky will set you back something between €66 and €75. But as the stock will diminish (it is only bottled once a year), expect to pay a bit more if you’re not a fast decision-maker.